A sophisticated meal of salmon with a side of garden salad and bruta cheese on a bed of sun-dried tomatoes sat at dozens of tables in Cipriani on 42nd Street. At the table’s center stood a three-tiered cake stand, reminiscent of a tea party, filled with bite-sized pastries and chocolate covered strawberries. 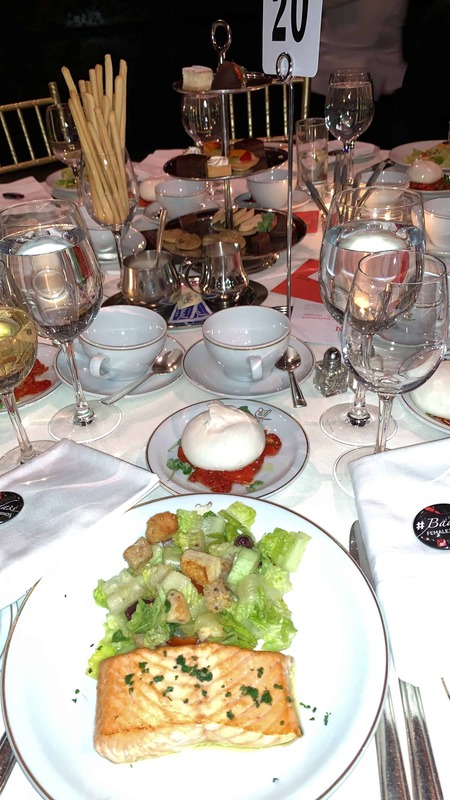 The delicious meal couldn’t stop the women in the room from reaching for their “#BadAssFemaleJourno” buttons before reaching for their forks. 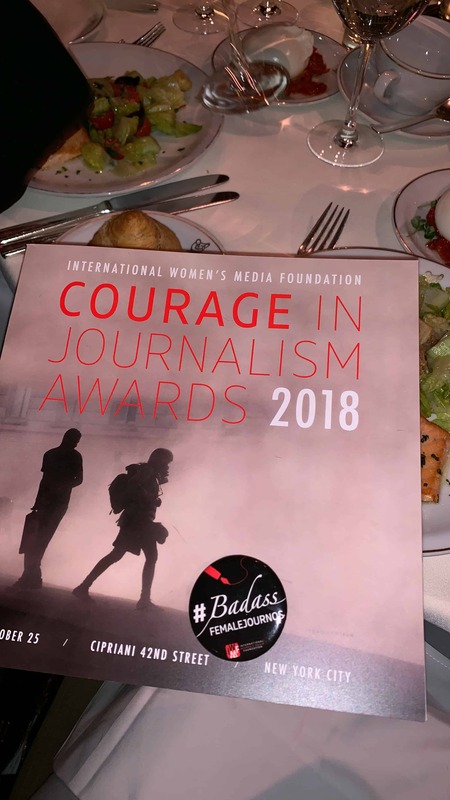 Four women journalists were honored for their ability to find strength in fear and discomfort on October 25th at The International Women’s Media Foundation’s 2018 Courage in Journalism Awards Ceremony. Photojournalist Meridith Kohut, Zeta editor-in-chief and crime reporter, Rosario Mosso Castro, CNN Senior International correspondent, Nima Elbagir, and the creator of JIHNA news, Zehra Dogan were the highlights of this year’s Courage in Journalism Awards thrown by the International Women’s Media Foundation. 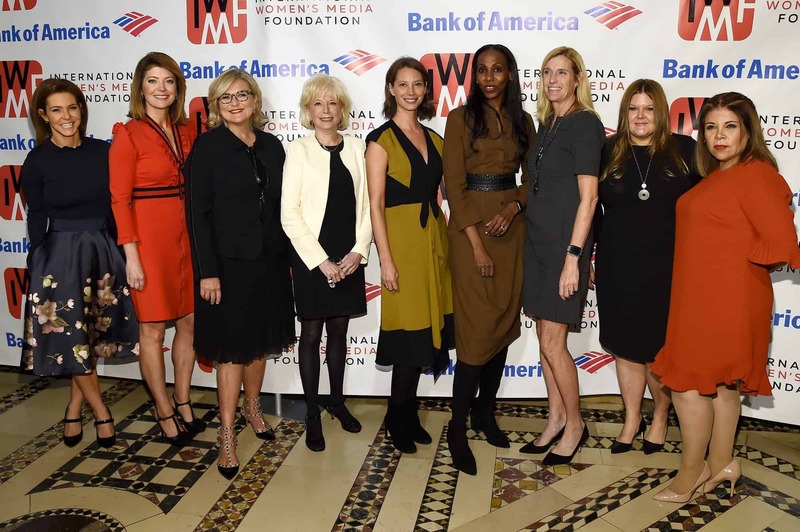 The honorees took their place on the red carpet before the awards began, and posed with the courageous Lesley Stahl who was the recipient of the Lifetime Achievement Award. Also honored was MSNBC President Phil Griffin who earned the Leadership Award and Karen Toulon whose fervor and dedication landed her the Gwen Ifill Award in honor of the late, legendary PBS NewsHour co-host. After pictures and interviews, guests took their seats for the awards ceremony which was co-hosted by Norah O’Donnell and Cynthia McFadden of CBS News. Shortly after, the audience had the opportunity to learn more about each honoree’s journey through video. “You want to get to the truth of something,” exclaims Nima Elbagir, who after hearing years of speculation, used her reporting skills to investigate and expose the practice of slave trading in Lybia. “I was most scared about not getting what we knew was happening,” she admits. With hopes of giving the African migrants an identity other than a victim, Elbagir sacrificed time with her toddler to report a sad truth. Also sacrificing herself is Zehra Dogan, an artist who is currently being held as a prisoner in Turkey for her creative works known for commenting on society and politics. Ironically, Dogan was moved to another prison on the morning of the awards ceremony, which made the message in her video even more daunting. These extraordinary women are superheroes who have proved themselves to be true badasses. Each is paving a way for female journalists who attempt, time and time again, to break glass ceilings. Be sure to follow the journey of the four women mentioned above and help spread awareness of the issues they risk their lives to report in hopes the public will take responsibility.